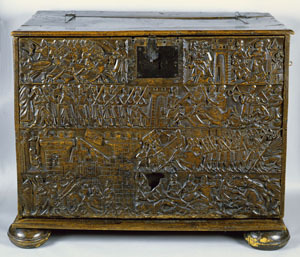 The Courtrai Chest was discovered around 1905 in the village of Stanton St John, a village largely owned by New College. Discovered by Warden Spooner on a Warden’s Progress, it was found in a barn of a College tenant where it was used as a feed bin. The chest is in 17th-century form, but the carved front is probably Flemish, and dates from the 14th century. The carving illustrates scenes from the Battle of the Golden Spurs fought in Courtrai, Flanders, on 11 July 1302. The battle was, in fact, a citizens’ uprising against the French king who had annexed Flanders some years before. The battle secured an unexpected victory for the Flemish artisan footmen against the army of French knights. The chest has recently returned to College, having been out on long term loan with the Ashmolean Museum. 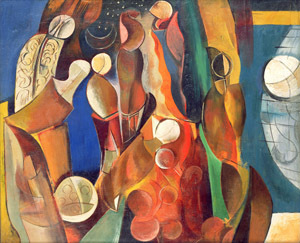 Robert Colquhoun’s The Spectators has been a part of the College’s Junior Common Room collection since 1960 and recent information suggests that it was painted c 1947. 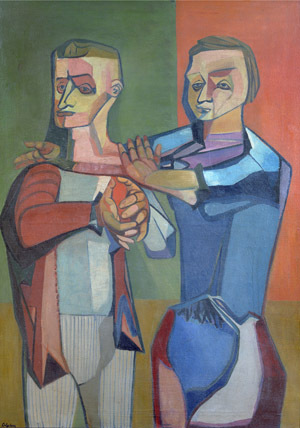 The two spectators are thought to be self-portraits of Robert Colquhoun and Robert MacBryde, so its inclusion in a recent major retrospective dedicated to the work of both artists at the Scottish National Gallery of Modern Art was particularly resonant. The exhibition - The Two Roberts: Robert Colquhoun and Robert MacBryde – ran from 22 November 2014 - 24 May 2015. Richard Woods’ ambitious NewBUILD installation at New College was created in 2005 and remained in place for several months. This was his first major outdoor work in this country and the project was one of several installations to use ‘red brick’ cladding made of wood to encase buildings, designed to change our perceptions of structure. The building used in New College was the 14th century Long Room and bath-house. 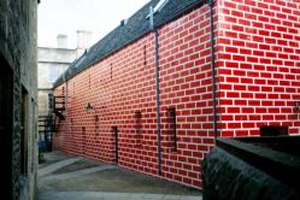 The artist employed his trademark block printing system to create a super-sized red brick graphic over the Cotswold stone exterior. The ‘Lego’ effect that this produced stood out in stark contrast to the more traditional medieval architecture that surrounded it, and succeeded in creating debate and dividing opinion. It is true to say that no one remained neutral to the project. White Square featured in the touring exhibition of William Gear's work, held at the Towner Art Gallery in Eastbourne and the City Art Centre in Edinburgh, to mark the centenary of his birth. The exhibition showcased around 100 pieces of his works of art, and highlighted his development of style from the 1930s through to the 1960s and beyond. 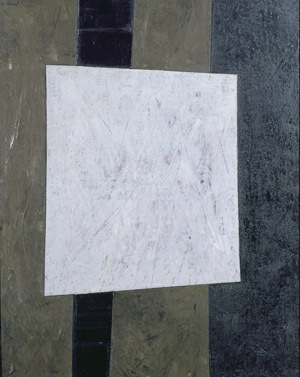 White Square, an abstract piece, is part of the College's JCR collection. The exhibition - William Gear 1915-1997: The Painter that Britain forgot - ran from October 2015 - February 2016. 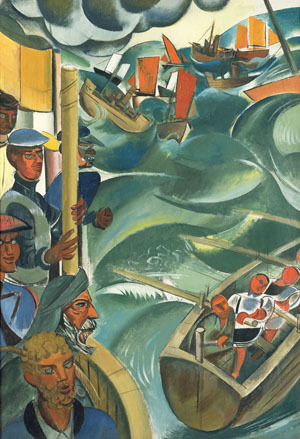 Both Newfoundland and Creation Myth were loaned to the Imperial War Museum North for an exhibition of Wyndham Lewis's work - the first retrospective to be held in the UK for almost 40 years. The exhibition was held to coincide with the 60th anniversary of his death, and 100 years after his commission as an official war artist in 1917, and it was part of the IWM North's First World War Centenary programme. The exhibition - Wyndham Lewis: Life, Art, War - ran from June 2017 - January 2018. These two prints were recently exhibited as part of the retrospective on Mary Fedden which was held in the Pembroke College JCR Art Gallery. 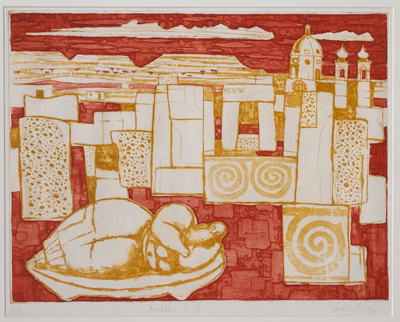 Julian Trevelyan's inclusion, alongside works by John Piper, Mary Newcombe and John Minton formed a visual explanation of how these artists influenced and inspired Mary's own work. 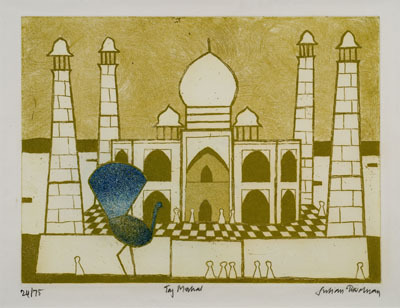 Both aquatint prints are part of the College's JCR (lending) collection. The exhibition - Mary Fedden: a voice of her own - ran from January - March 2018.